A fresh modulation flavour to add to your arsenal. Some sought-after vintage effects recreated. Two modes cover all possibilities. The Boss MD-500 may be more cost-effective at a £306 street price. From 1979 onwards, it wouldn’t have been uncommon to hear, “Can we have a bit of grey button on that?” in high-end recording studios. That grey button was setting number 4 (the strongest) on the rackmount Roland SDD-320 Dimension D (settings 1, 2 and 3 had white buttons). What you’d be getting was a spatial effect adding a dimension to the sound - chorus-like but somewhat different from the more obviously mobile chorus effect. Stevie Ray Vaughan apparently favoured a Dimension D to thicken up guitar sounds on his album mixes. That Dimension D was a large and expensive studio box, but in 1985 Roland put some of its essence into a compact pedal, the Boss DC-2 Dimension C, which it produced for four years. 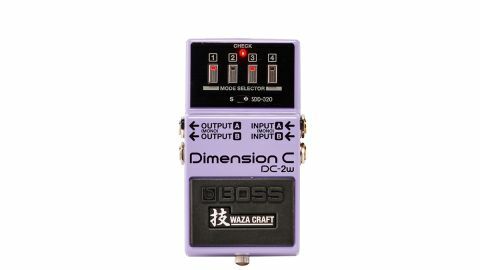 That Dimension effect is now back in a new Waza Craft pedal with two voicing options: one that replicates the Dimension C pedal and one designed to mimic the original SDD-320. The new chorus pedal has the same user interface as the previous incarnations, with not a knob in sight, just four buttons, although you can select two buttons at a time allowing 10 different settings for each voicing. While dual inputs and outputs offer full stereo operation, the pedal also works well in standard mono setups. The Dimension effect is very similar to chorus, although you don’t get the obvious perceptible cyclic modulation that you’d hear with higher levels of chorus rate and depth. In an A/B test, the ‘button 1’ setting on the DC-2W was pretty comparable to a classic ‘10 to 2’ knob setting on our vintage CE-2. Other settings offer richer variations providing depth, shimmer and a sparkle that works brilliantly with chordal arpeggios and strumming parts. And it’s not just good for clean sounds the pedal also takes drive and distortion extremely well, and is well suited to tasks where you might have opted for a flanger or rotary effect. If you’ve been aware of the Dimension D and C units but didn’t fancy the high secondhand prices and unreliability, this Waza iteration offers you the chance to buy into it. For anyone coming new to this, think of it as a fresh modulation flavour to add to your arsenal - particularly if you’re running a stereo rig, as there aren’t many pedals that can widen and enrich your sound in such a pleasing manner.